"Comprehensive solution and transformation of your educational institutions." Genius EduSoft is a user-interactive, flexible, robust, easy-to-access and diversified School / College / University Management ERP platform, which can be embedded in every generation devices. It is a smart educational system, which enables every feature, functions and completes the daily needs of School, Colleges, Universities and Educational Institutions. It provides different roles and functionality to every unique user with diversified perspective. "Experience the hassle free performance with Multiple cross-platform features and simple yet dynamic interface"
School admin can manage Semester vise subject list, Assign subjects and subject allocation to faculties. A daily lesson plan is developed by a teacher to guide class learning, subject being covered, and the needs of the students. Faculties have take attendance of the students using Mobile application and parents can able see daily student attendance report. Handling inquiries from prospective students, Handling the admissions process; Enrolling new students. Update the up coming information show in circular section. Our system provide to manage study,training,achievements certificates and generate customize certificate. List of department manage through the system. The Dashboard provides a quick overview, with additional detail available, about overall performance of students, Teaching staff. Create and development of large-scale events such as festivals and sports day. Assign the task by teacher and principal to related topics through priority wise. Our module allows generating, maintaining and monitoring subject timetables,food timetable and exam timetable with speed and ease. Teachers,parents,principal can seen track student ID card. Our module provides email and notification facility as well as communication. Our module manage half leave, sick leave, and casual leave, holidays. Our module display list of vehicle number,max seat allocation,insurance renewal date and driver's contact number and details. Our module track vehicle through RFID system. Our module manage pick up and Drop facility of the students and employee. also details of Fees structure. Manage allocate transportation with start and end date. Manage list of books category. Manage teachers and student book issue and retuen Process. List of hostel type, No. of students details,No of students live in hostel, fees structure. Teacher can generate manual exam paper , arrange exam for students. Our module view,upload and download the question bank.  Our module Generate subject wise online exam and gives the instant result to students. Show and manage weekly, monthly and yearly exam timetable when it is start and end date. According the student exam performance wise generate grades and ranking level. Display and manage exam result. Manage the list of exam conducted by supervisor and examiner check the subject wise paper. To display students performance in various reports and mention to teachers and principal signature. Define the ranking level of individual class. Our module display to employee list, designation,pay head ,amount type and unit. Display and manage master date type. Display the entries of payment type name. Our module generate pay slip and manage monthly and yearly employees wise report. Our module manage bank/cash transaction,expense and general voucher. School fees, issuing fee receipts and fee register update is done with the help of our module resulting in highly accurate data. Our module manage Journal Book, Cash/Bank Book, General Ledger, Trial Balance, Balance Sheet, Profit AND Loss..etc reports. HR can manage list of actions like Manages organization,Planning and controlling resources ,Recruiting,Job posting,Analysis of work,Team planning. Our System can manage Account Master, Expense Master, Bank/Cash Master,Tax Master..etc. Multi-cross functions and features will empower institutions for the digital evolution. Providing different functions and features to all the registered users with Unlimited access to the ERP system. Customize and manage different profiles on different modules. Manage and view user's attendance with a detailed report. Add, View and Check Homework by teachers and students. Account Department can easily optimize hefty fees transactions. Automated timetable for every single class and divisions. "We are proud to work with a fantastic set of clients"